Tickets must be redeemed at the Attraction Counter - only original copies or mobile voucher accepted. Other Terms & Conditions Apply. Glide across the Olympic-sized Dubai Ice Rink where unlimited fun awaits skating enthusiasts. Dubai Ice Rink is a must-visit leisure attraction and sports venue in The Dubai Mall, the largest mall in the world. Have you never skated before? Not a problem, training sessions are available to teach you how to ice-skate! In addition to skating sessions and training programmes, Dubai Ice Rink has further enhanced its lifestyle appeal with cool Disco nights and foam parties. The rink also has a snow-fall feature that makes the skating experience more magical. So enjoy a winter wonderland in Dubai Mall! Ice marshals will always on the ice to ensure the safety of all guests. You will also find a Zamboni on the ice every couple of hours which is a resurfacing machine will that ensure the highest quality of ice underneath your skates for an easier and smoother skating experience. Dubai Ice Rink hosts a variety of activities and events that everyone can enjoy, such as hockey games and broomball, so look out for event details on the website. There is also a selection of cafes that allow you to take a break and refuel before getting back on the ice! It is okay if you are not an experienced skater because Dubai Ice Rink has skate aids to help you, especially children. The skate aids can be hired on a first come first serve basis. Double-bladed skates are also available for those who are not experienced skaters, especially children. Lockers are available for customers skating at a cost of AED 10 plus AED 20 deposit. 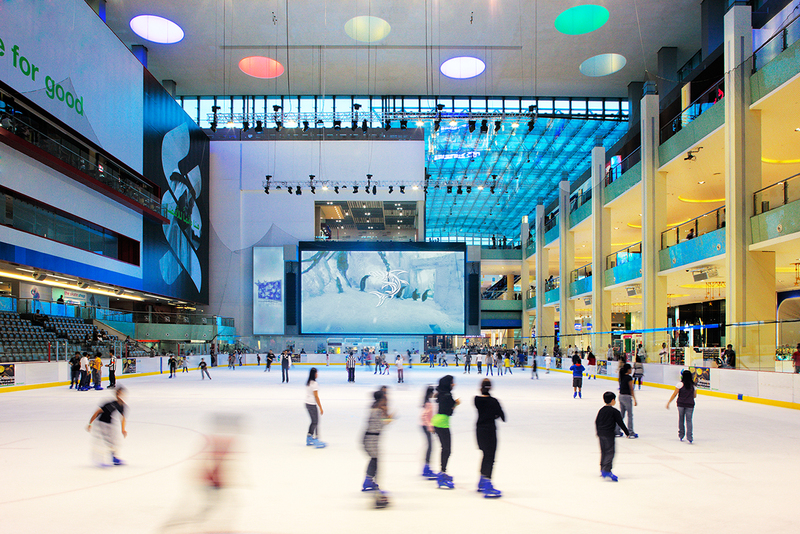 The easiest and most convenient way to reach the Ice Rink at the Dubai Mall is to by taking the Metro. The RTA buses can also take you to Dubai Mall or you can take RTA taxis. You won't want to forget warm clothing and thick socks!